Please note that these instructions relate only to isolates and specimens of human influenza viruses , ie. A(H1N1), A(H3N2) and type B viruses. If you have a highly pathogenic influenza strain (eg. Avian influenza H7 and H5 subtypes), please email us at whoflu@influenzacentre.org. • Please contact us at whoflu@influenzacentre.org to inform us of your intention to send us samples, so we can expect your shipment. • If you can identify the subtype of your samples using the HI Typing Assay prior to shipping, this will greatly assist processing at the WHO CC. If this is not possible, or if you have an urgent sample for which the Diagnostic Assay will delay shipping, please send us your sample immediately and we will determine the subtype at the WHO CC. To learn more about the HI Typing Assay, click here. AQIS Permit: Please email us to request a copy of our current import permit. When filling out the Sample Submission Form, please provide as much information as possible (including relevant patient data), as this will greatly assist us in processing the samples. • Both clinical specimens and viral isolates should be stored at -70°C and shipped on dry ice. (The viruses will not survive if they are stored at -20°C and shipped on wet ice.) Please minimise the number of times that clinical specimens are freeze-thawed. • If sending viral isolates, please send 1-2ml of isolate. • For clinical specimens, it is ideal to send at least 0.5-1ml of specimen (and more if possible). However if this is not possible, please send whatever volume you can provide. • Samples should be sent in clearly labelled neoprene tubes with leak-proof caps. If your samples are frozen and in leak-proof tubes, wrapping in parafilm should not be necessary. Please ensure that your labels are securely fastened and not at risk of falling off or being erased while being shipped – if possible please use non-erasable ink. 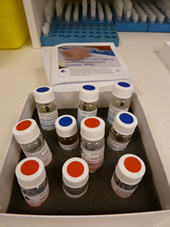 All samples to be shipped to the WHO Collaborating Centre require paperwork to be completed. Please follow the instructions below, depending on whether you are a WHO National Influenza Centre or an Independent Laboratory. As a WHO National Influenza Centre, you have access to the WHO Shipping Fund. To book a shipment with the Fund, fill out and submit the Booking Form below to World Courier Geneva. The courier will assist you with the consignment note, customs forms and commercial invoice required for shipping. Australian Customs requires the following documents to be provided with your shipment. We have provided templates for these documents to best ensure your samples reach us quickly. AQIS Permit 2 copies Please email us to request a copy of our current import permit. Please contact us if you have any questions or require any other information.